Edited because I forgot about the spinach. Oops!. Three. Four. Count ’em, three four super foods: turkey, walnuts, blueberries and spinach. Woohoo. 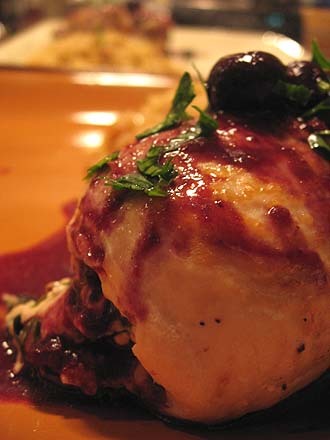 I saw a recipe for a blueberry-port sauce which I thought looked very good (originally, it was alongside a pork tenderloin) but instead, I decided to pair it up with a stuffed chicken breast. 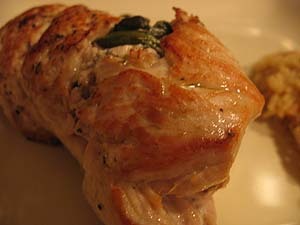 The idea for the turkey is almost exactly like the stuffed chicken breast I have been known to make on occasion. Pound it out between layers of plastic wrap, spread it with a little goat cheese and walnuts (or some kind of tasty stuffing), roll it up, cook and voila. This is just like that. 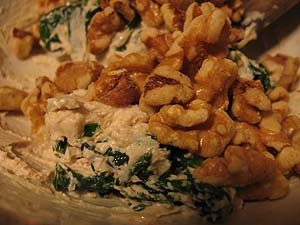 Mix the room temperature goat cheese with the toasted walnuts, garlic, spinach and zest. Set aside. Pound out your tenderloins and season with some salt and pepper. Spread some of the cheese mixture on the flattened turkey and roll up. If you want to get fancy you can tie these up but I just opted to flip carefully in the pan. 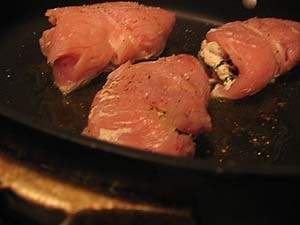 Preheat the oven to 350 and get an oven-proof skillet on the stove top over medium high heat. Add the oil and brown the turkey rolls on each side. 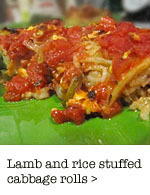 Place in the oven and finish cooking for about 10-20 minutes. Use a meat thermometer for this as mine were done earlier than I thought they would be — in about 10 minutes. At 165 degrees, remove the turkey rolls and let rest. Start the sauce before you start the turkey. You can get it to the syrupy stage and then let it sit while you get the turkey to the point when it goes in the oven. Then finish the sauce while the turkey bakes and then rests (covered with foil) for about 10 minutes. 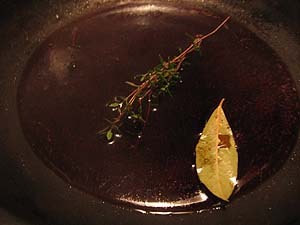 In a medium saucepan combine the vinegar, port, shallots, garlic (if using), thyme, and bay leaf over high heat. 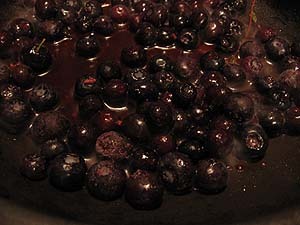 Bring to a boil and reduce mixture by about 2/3, or until thick and syrupy, about 10 to 12 minutes. Add blueberries and chicken broth. Bring the mixture to a low boil and cook until blueberries are softened and sauce is a thickened, syrupy consistency, 12-14 minutes. Season with salt and pepper. Pour any accumulated turkey drippings into the suace. Taste and adjust anything that needs adjustin’. 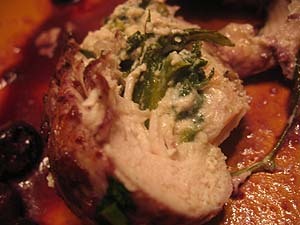 Spoon over plated stuffed turkey tenderloin. It’s super! What would you suggest if you are not a fan of goat cheese or feta cheese? Would ricotta be a good substitution? What about using an herb cream cheese or plain neufchatel cheese since the texture mimics goat cheese? That may work for someone not interested in goat cheese. 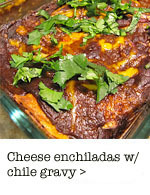 Your site and recipes are great. I always check in! Sincerely – Colleen, Naperville, IL. That’s a great idea! Either of those. Or maybe even mascarpone? They all seem heavier than ricotta so they might work a bit better if someone didn’t want to use goat or feta. 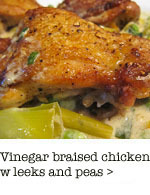 Another great recipe for my del.ici.ous files. Thanks Michelle! 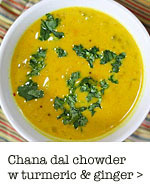 this is so delicious looking-will try soon! This was a delicious and elegant combination. 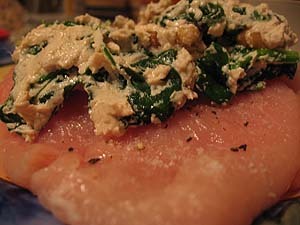 The sauce could be made ahead of time, rewarmed, with the turkey drippings added before serving. Garlic is listed twice, but is mentioned only once in the directions. I added the two minced garlic cloves to the goat cheese mixture. 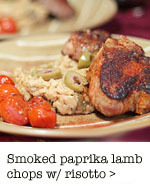 You have a good looking site with appetizing recipes and helpful photos. It’s one of my favorite foodblogs. Oh and great idea about amking the sauce early. You could even do a day or two before, I’d bet.